Fielder Custom Pools and You will create your vision and surpass your expectations. Your ideas and our expertise will prove to be a great team. From start to finish we will be with you every step of the way, as we are owner supervised. With over 40 years experience you will enjoy the confidence we deliver. We provide and accept only the industries highest standards. ​Why Choose Fielder Custom Pools? Today's pool construction is much more detailed and complex than the accepted standard, 40 years ago. Our customers now enjoy the ease and control of all water features, lighting, water temperature control etc. with the touch of a button from inside the home. A Fielder Pool is professionally designed starting with a thorough assessment of your yard, space and surroundings. We compliment your home's décor, reflecting the pool design, textures and colors of your home. Our main objective is to have a beautifully completed project that looks as if, it has been in the backyard from day one.. We account for the changes in elevations as well as the existing landscapes. The swimming pools we construct are made of only the finest materials available and will last a lifetime. Our hands on, owner supervised projects ensure a smooth running and completed project. Our subcontractors are tested, tried and proven, each and everyone is required to carry liability insurance. A Fielder Custom Pool swimming pool is well known to be unique in design and functionality. It is not just your pool, it is ours! We offer a full regimen of design and construction to satisfy even the most demanding customer needs. 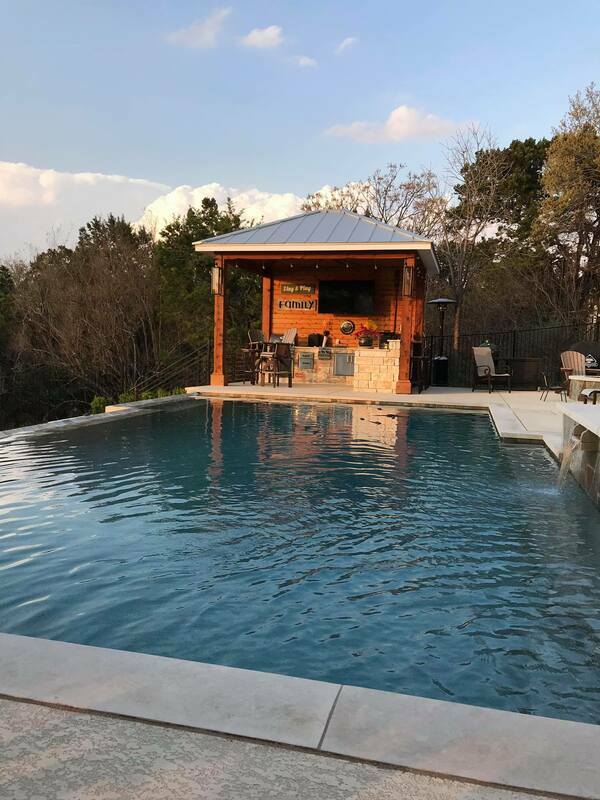 Our offerings include waterfalls, grotto caves, negative edges, fire pits and fire places, pergolas, cabanas, rain curtains, outdoor living space, outdoor kitchens and much, more! Our imagination is limitless. ©2014 Fielder Custom Pools. All Rights Reserved.